This is the second part of my journey through the cave temples of Mahabalipuram. For the first part click here. We continued our journey through the rock cut caves of Mahabalipuram. After visiting the most famous ones, it was the turn for those hidden caves which tourists miss to notice. If you are keen in archaeology, then the below cave temples of Mahabalipuram are a real treat for you. Unlike the other Mandapas, Ramanuja Mandapa has peculiar front façade, which looks like it is unfinished. 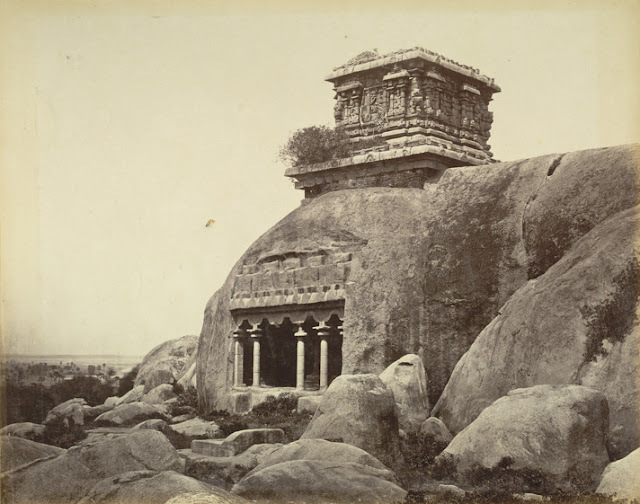 The Ramanuja Mantapa was once a fully finished cave temple dedicated to Lord Shiva built by Paramesvaravarman I, however it was totally vandalized during the Vaishnava resurgence. The sanctums inside this Mandapa doesn’t have any deities in them. They might probably have been removed while these cave being attacked. The front façade which has a striking dissimilarity with the rest of the construction was originally built during the Vijayanagara empire (1409-1542). However due to some unknown reasons the construction wasn’t carried out further. Even after being vandalized, an inscription praising Rudra(Shiva) was found on the floor of this cave and it reads as "Six times cursed be those in whose hearts does not dwell Rudra (Shiva), the deliverer from the walking on the evil path" . It is quite intriguing that after being the idol is removed and the sanctum is completely destroyed, the inscription was not rubbed off the rock. As we stand facing the the Mandapa, image of Durga is carved at the right most end of the Mandapa. Durga is depicted as standing on the head of Mahishasura - the demon she killed in the battle. There are three sanctums in the Thrimurthi Mandapa. The central sanctum houses Shiva with his Ganas, and devotees are sitting at his foot. You can also see some modern days devotees in yellow pants around the Shiva Linga. The cell to the right of Shiva has Vishnu having four hands and holding Sankha and Chakra in each of his hands. This image looks very much similar to the above Shiva. However if we notice the posture of the devotees and the weapons in the hands of the idol, the difference will be clear. The cell to the left has bearded Dwara Palakas(Door Keepers) and the deity in this cell is Subramanya Guru Murthi, wearing beads across his chest and standing in the Brahma’s posture. There is no pillared hall in front of the sanctums. There is an ancient inscription found the floor of this cave referred “Malla” as the builder of this caves. This might refer to the Narasimhavarman Mamalla I. The cave temple which has at most relevance in the archeology of Mahabalipuram is the Adi-varaha-cave temple. From the ancient inscriptions found in this cave, the actual name of this temple is “Parameswara Mahavaraha Vishnu Gruham”. This is a temple dedicated to the “Varaha (Boar)” avatar of Maha Vishnu. It is very common to confuse between the “Adi Varaha cave temple” and the “Varaha Cave temple”. They are two different cave temples located at a distance apart. This cave temple is a little difficult to find due to its remote location. It is not open throughout the day as the “Varaha” deity is still being worshiped here. The temple opens for Pooja only in the morning and evening. It is prohibited to photograph the deity. We couldn't visit there, however I am sharing the information that I gathered about this temple. On the walls of the Adi Varaha Cave temple many raised sculptures (high relief) of Hindu Gods are depicted. 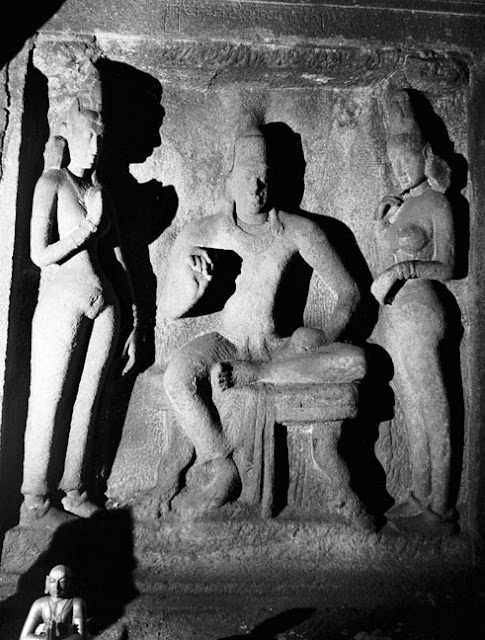 However, the figures which have sparked most debate among the archeologist are that of two Pallava kings depicted below. An inscription above this figure says “The glorious Adhiraja Simhavinna Pottra” referring to possibly the first Pallava king Simhavishnu. The figure seated is Simhavishu with his wives on either side of him. It has leaded the scholars to argue that this cave was the most ancient and was possibly built by Simhavishnu himself. The second sculpture is that of the Mahendravarman I, son of Simhavishnu and the inscription above this panel says ““The glorious Adhiraja Mahendra Pottra” . This also has started a huge debate between the Mahabalipuram scholars that the Adivaraha temple might have been built by either Simhavishnu or Mahendravarman I, contrary to the popular belief that most of the Mahabalipuram was constructed by Narasimhavarman Mahamallan I, the grandson of Mahendravarman I. There is another inscription of high historical value in this cave. This inscription lists the 10 avatars of Vishnu and the ninth avatar is listed as “Buddha”. This inscription is very important as before its discovery, it was assumed the inclusion of Buddha, as an incarnation of Vishnu, was done sometime in twelfth century. However as this temple is assigned to mid-6th century so it is clear that as early as this time Buddha was already seen as an incarnation of Vishnu. There are three more smaller cave temples in Mahabalipuram. We couldn't visit them as we did not know that they existed! I am noting them down so that the future travelers doesn't miss out these temples. After my visit to Mahabalipuram I read about the below temples and I still am disappointed that I missed them. There are two caves in the Koneri Mandapa. One is unfinished and shows the rock is being excavated. The other has two rows of pillars. There are 5 cells none of them have a deity. The cave is very old and believed to be built by Mahendravarman 1 due to the characteristic style of his pillars are relatively simple construction. There are only Dwara Palakas(Door Keepers) in front of each of each sanctum and from the posture and weapons of the Dwara Palakas scholars could guess the deities. It might be an early excavation for a female deity. The pillars are very simple indicating an olden style and there are two female Dwara Palikas indicating the female deity. The Dharmaraja Mandapa is located right behind the light house. This Mandapa is believed to have been built by Mahendravarman I as the pillars suggest great similarity to Mahendravarman style.Which are quite simple with square at the bottom, octagonal at the center and square at the top. There are three cells in the temple and all these cells are empty. Dharmaraja Mandapa is quite simple with any ornamentation on the façade and can be considered as one of the oldest creations in Mahabalipuram. This cave was vandalized during the Vaishnava resurgence. We can see that the Dwara Palaka figures are chiseled off. From an ancient inscription found on this cave temple, the proper name of this temple can be deduced as Atyantakama-Pallaveshvara-griham – means Ishvara temple of Atyantakama Pallava. It shows that this temple was initially dedicated to Shiva. This article would not be complete without mentioning two curious constructions that can be found around the lighthouse are of Mahabalipuram. These give hints the existence of a palace complex at this place - these are Draupati Bath and Stone bed. In the boulders around the light house, one can see a flight of steps leading to nowhere! 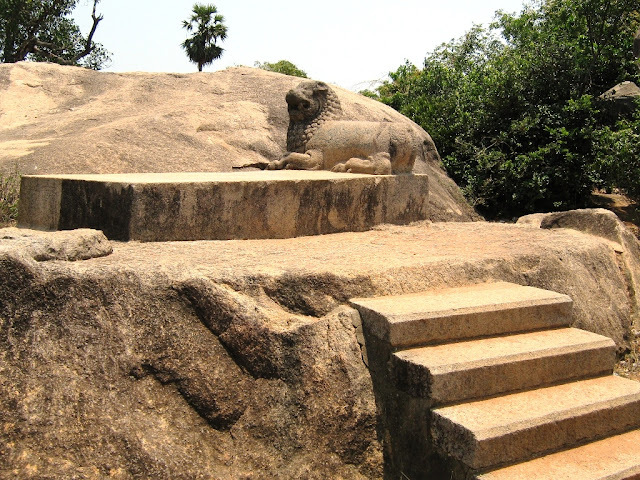 Just below one such stairs, There is a stone bed with a lion pillow at one end of it suggesting that it might be the seat of the king (Simhasana) but there is no other construction around it. It is popularly known as the “Dharmaraja Bed”. As we climb the rocks and there are some more steps leading to a pond and it is locally known as the Draupathi’s Bath. There are also water channels carved on the rock boulders suggesting the existence of some residential complex in this area.